Insta360’s selfie stick designed for Insta360 ONE and other 360 cameras, is now available on Amazon. Previously, they were available only from Insta360 directly for $29 plus shipping. On Amazon, they are $16 with free 2-day shipping for Amazon Prime members. I’m still working on a full review but here are specifications, features, and my first impressions of the Insta360 ONE selfie stick. – Compact yet long: Folded length is about 11 inches. Fully extended length is about 47 inches tip to tip. This is one of the longest selfie sticks I have, just a few inches shorter than the Manfrotto Compact Extreme (54 inches), while being significantly shorter when collapsed (18.5 inches vs. 11 inches collapsed). Having a long selfie stick is useful for the ONE because effects such as bullet time look better when the camera is a bit farther away. – Build quality: The selfie stick has very good build quality and is made of aluminum alloy, similar to other selfie sticks such as the popular Smatree SmaPole, so it is both lightweight and reasonably stiff. It has less flex than low cost selfie sticks with stainless steel shafts. The handle is thin but comfortable, with an anti-slip texture. – Standard 1/4-20 tripod hole on the base, with a small hole for a wrist strap (wrist strap not included). – No ballhead: this is an advantage when using a selfie stick for a 360 camera. Without a ballhead, the 360 camera will always be in-line with the shaft. This minimizes the appearance of the shaft (see Invisibility below). The 360 camera also won’t flop over even if you shake the stick. – Invisible: When using the selfie stick with the Insta360 ONE or any a 360 camera that is at least 1-inch (25mm) thick, the Insta360 ONE will appear invisible. – Extending and collapsing the selfie stick: simply twist the selfie stick, extend it to the desired length, and twist back to lock. It will hold the position even if you use it with a heavy camera. Some Insta360 selfie sticks include a bluetooth remote. 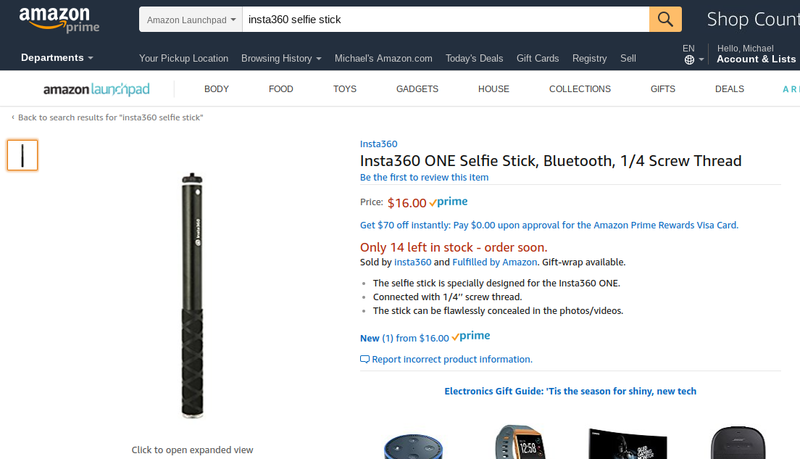 I’m not sure if the Amazon listing includes it because the picture doesn’t show it, but the item is called “Insta360 ONE selfie stick Bluetooth.” Anyway the benefit of the special Bluetooth remote is that it can control the Insta360 ONE without a phone. To setup the Bluetooth remote: First, make sure your phone, your camera, and the remote are all charged. 1. Turn on the Bluetooth remote. It will flash blue. 2. Attach the Insta360 ONE to your phone, and in the ONE app, go to Settings. 3. In the settings, tap on the “Shoot with Bluetooth Remote” option. 4. In the next screen, tap on Scan for Bluetooth. When it finds your Bluetooth remote, tap on it and click on Confirm. The remote will stop flashing blue. You’ll get a message that your camera has been paired with the remote. After the connection is setup, you just turn on the camera (without being attached to the phone), turn on the Bluetooth remote, and they will be paired automatically (the blue light will disappear). The large shutter is for photos, while the small shutter is for videos. Triple-clicking or double-clicking the main shutter has no effect (it won’t activate the triple-click function). You can also use other Bluetooth remotes with the Insta360 ONE but the ONE must be connected to the phone. With the Bluetooth accessory, you don’t need your phone to connect the ONE to the BT remote. The Bluetooth remote has a built-in rechargeable battery and can be charged via Micro USB. So I’m guessing this would still be visible with the Mi Sphere, correct? Just received the Amazon product ordered as above but it does NOT have Bluetooth despite saying “Insta360 ONE selfie stick Bluetooth” I shall be asking for a refund, please edit this entry accordingly in the title! Came here to say the same thing-no Bluetooth included. Is this good with mijia? Would it be possible to cut some of the plastic off to make it invisible when using it with the Mi Sphere? Hi, does this mean that the remote on the Benro MK10 doesn’t work without the phone connected or does it mean that every time I want to use the remote I need to connect it using the phone and take it of the phone to use.